My first association with the music of York Bowen was receiving a review copy that featured his splendid Horn Quintet in C major, Op 85. It was played by the Endymion Ensemble with Stephen Sterling (horn) and recorded in London 2001. The disc was Dutton Epoch CDLX 7115 (c/w Rhapsody Trio and Trio in Three movements). I also enjoyed the 2001 recording of Bowen’s second and third String Quartets and the Phantasy-Quintet from the Archaeus Quartet with Timothy Lines (bass clarinet) on British Music Society BMS426CD. Best of all was a revelatory two disc set Music for Viola recorded at Potton Hall, Suffolk in 2007. It was played by Lawrence Power (viola) and Simon Crawford-Phillips (piano) on Hyperion CDA67651/2. I commended this release as one of my 2008 ‘Records of the Year’. Another Bowen disc that continues to provide pleasure is the 2005 Watford recording of the Violin Concerto in E minor, Op 33 and Piano Concerto No. 1 in E flat, Op 11 performed by Lorraine McAslan (violin), Michael Dussek (piano) with the BBC Concert Orchestra under Vernon Handley on Dutton Epoch CDLX 7169. Thankfully we can now see that after a number of decades languishing in relative obscurity York Bowen’s tonal and conservative music with its elegant lyricism is enjoying a significant and deserved revival. Dutton and Hyperion alongside the Chandos, BMS, ClassicO and Lyrita can take considerable credit for spearheading this resurgence of interest. The works of Bowen, a former student at the Royal Academy of Music (RAM), are steeped in the traditions of Brahms and Franck. There is a real eclectic blend of influences that I hear from late-Romantic composers such as Strauss, Elgar, Rachmaninov, Ravel, Vaughan Williams, Tchaikovsky and Delius; they’re all there. At times one detects a French feel to their emotional character and charm, with suggestions of English pastoral along the way. Interestingly a trusted friend of mine who is a music writer of long-standing heard the disc of Bowen’s second and third String Quartets and Phantasy-Quintet without knowing the identity of the composer (this he calls his “blind-date”). My friend thought he was listening to a French composer, almost certainly a pupil of Franck. To my ears these piano works predominantly emulate the sound-world of Chopin, Rachmaninov and Medtner. Without being pale imitations they never achieve quite the same eminence or memorability as their distinguished models. Owing to his prodigious talent as a pianist and his compositional prowess Bowen was sometimes described as ‘the English Rachmaninov’. 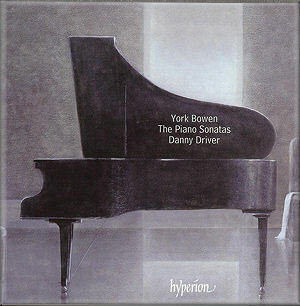 With regard to his specialist instrument, and courtesy of Hyperion, the Bowen catalogue can now boast an excellent premiere recording of the complete set of piano sonatas played by Danny Driver. It seems that all three early sonatas on the first disc are receiving their first recordings. Driver is no stranger to Bowen’s music having already recorded his Piano Concerto No. 3 in G minor (Fantasia), Op. 23 and the Piano Concerto No. 4 in A minor, Op. 88 with the BBC Scottish Symphony Orchestra under Martyn Brabbins on Hyperion CDA67659. I have heard soloist Driver perform York Bowen before in 2008 at the Cosmo Rodewald Concert Hall, Manchester playing in a recital that included the Bowen 5th Piano Sonata. I sincerely hope it is not too long before I hear this splendid pianist again in recital. The first disc of the double set contains the three pre-Great War piano sonatas. The Piano Sonata No. 1 in B minor, Op. 6 is cast in four movements and is the longest of the set of six sonatas. Published privately in 1902 the score bears a dedication by the teenage Bowen to Claude Gascoigne his friend at the RAM and piano duet partner. The opening Allegro con fuoco is typically bittersweet and I found Driver’s interpretation of the languorous Larghetto rather comforting. A light and sweet Tempo di Minuetto precedes a tempestuous finale that is not without contrasting episodes of relative calm and compassion. A three movement score, the Piano Sonata No. 2 in C sharp minor, Op. 9 seems to be a close contemporary to the B minor Sonata, Op. 6. The opening Allegro is typically dramatic with episodes of melancholy. Affectionate and comforting, the Andante cantabile evokes scenes of snuggling up by a roaring log fire on a cold winter’s evening. Marked Allegro molto the finale is an impassioned outpouring played here with significant ardour. Completed in 1912, the three movement Piano Sonata No. 3 in D minor, Op. 12 is a score more technically and emotionally developed than its predecessors. The opening movement Allegro ma non troppo is typically stormy with a moment of veritable tenderness. Driver delights in the light and appealing scoring of the extended central movement Andante cantabile. I just loved the red-blooded finale - one of Bowen’s finest solo piano movements. Disc two comprises the remaining three piano sonatas that Bowen composed after the Great War. They span a near forty year period that reaches to the early 1960s. The Piano Sonata No. 4 is thought to have existed but no score has ever been found. Now taking its place in the catalogues is the three movement Short Sonata in C sharp minor, Op. 35/1 - a real gem completed in 1922. The score of the Short Sonata was dedicated by the thirty-eight year old Bowen, “To my wife and son”. The leisurely pace of the Andante con moto has a somewhat pastoral atmosphere; maybe a verdant Alpine scene. The central Lento expressivo is a glorious movement: melodic, moderately dramatic and quite charming. I was struck by the appeal of the fleet-footed and frolicsome Presto scherzando played here with considerable verve. Published before it was premiered, the Piano Sonata No. 5 in F minor, Op. 72 was completed in 1923. It has been said that the three movement score was designed to carry certain similarities to Beethoven’s Appassionata. Thirty-eight years were to separate this F minor score from Bowen’s final piano sonata. With Driver’s natural assurance the opening movement marked Moderato comes across as a restless mood painting. In the Andante semplice I was struck by a warmth and security I associate with a child’s nursery. Upbeat writing in the engaging final movement oscillates between the whimsical and the ardent. From 1961, the year of Bowen’s death, the Piano Sonata No. 6 in B flat minor, Op. 160 is probably his final composition. The late-Romantic writing doesn’t display any notion of diminishing compositional capacity. However, in an era with younger composers Berg, Prokofiev, Honegger, Hindemith, Poulenc, Shostakovich, Messiaen, Britten and Tippett taking centre-stage it’s not surprising that Bowen’s compositional style was considered anachronistic. Thankfully we are now able to enjoy Bowen for his innate quality rather than for the dynamic of the era in which it was written. I especially enjoyed Driver’s playing of the swirling and heady Romanticism of the opening movement. The reflective, affectionate and often alluring mood of the Intermezzo is impressively interpreted. Turbulent, with tremendous rhythmic zest, the rapt appeal of the finale is also hard to resist. With performances such as these a successful future for Danny Driver seems assured. This young soloist plays with sympathy and dedication, buoyancy and freshness. This is a splendid set from Hyperion that should broaden York Bowen’s appeal still further. Francis Pott has as usual done a fine job with the booklet essay. Beautifully recorded by the Hyperion engineers at the Henry Wood Hall with warmth and considerable clarity.